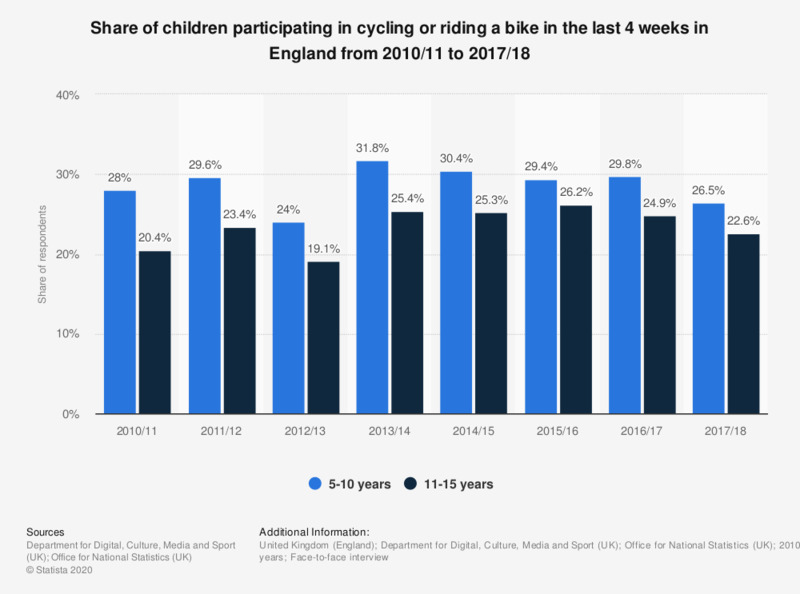 This statistic presents the share of children who recently participated in cycling or riding a bike in England, according to annual surveys conducted between 2010/11 and 2017/18. Over this period, the proportion of children cycling has been relatively constant. In the period 2017/18, around 22.6 percent of the children aged between 11 and 15 had ridden a bike in the last 4 weeks prior to the survey. 2016/17: 5-10 year olds: n= 967; 10-15 year olds n=638. 2015/16: 5-10 year olds: n= 1,096; 10-15 year olds n=684. 2015/14: 5-10 year olds: n= 1,104; 10-15 year olds n=721. 2013/14: 5-10 year olds: n= 1,233; 10-15 year olds n=786. 2012/13: 5-10 year olds: n= 1,136; 10-15 year olds n=801. 2011/12: 5-10 year olds: n= 1,040; 10-15 year olds n=771. 2010/11: 5-10 year olds: n= 1,590; 10-15 year olds n=1,116. Survey periods run April to March. The source provides the following additional information: "Data for 5-10 year olds relates to out of school activities only. Data for 11-15 years olds relates to activities undertaken both in and out of school." Everything On "Cycling in the United Kingdom" in One Document: Edited and Divided into Handy Chapters. Including Detailed References. Statistics on "Cycling in the United Kingdom"
Where do you usually go cycling? How often do you go cycling?